We Be Reading: "I was leaning against the bar in a speakeasy on Fifty-second Street, waiting for Nora to finish her Christmas shopping ..."
"I was leaning against the bar in a speakeasy on Fifty-second Street, waiting for Nora to finish her Christmas shopping ..."
A few years ago the husband and I discovered the Thin Man movies starring William Powell and Myrna Loy. We loved them for their wit and humor and also the strong detective stories. Powell and Loy are one of those classic Hollywood couples that have perfect on-screen chemistry. 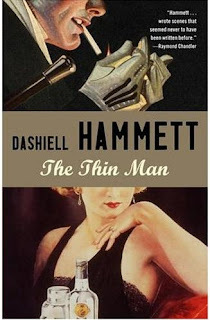 So when I was choosing books from the 1000 Books to Read Before You Die list, I knew that I would have to read the source, Dashiell Hammett's The Thin Man. This classic detective story stars Nick Charles, a private detective turned businessman, his darling wife Nora and their terrier, Asta. They are visiting New York for their Christmas holiday and they get involved in a murder investigation due to Nick's former profession. A woman is murdered and her employer is missing. The employer's family is a trio of lunatics and those around them aren't much better. The mystery is strong in this story but what really stands out is the writing. It's incredibly simplistic and plot-driven but at the same time the characters are witty and smart--and usually tight (drunk). 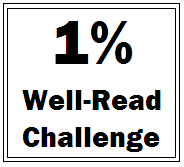 I'm very glad to have read this book for the 1% Well-Read Challenge. It's an amusing look into 1930's culture with visits to the speakeasy, lots of burly cops and some unique slang. 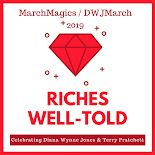 This is my fourth book to count toward the challenge and so far, between Rebecca, Breakfast at Tiffany's, Pride and Prejudice and this one, I think that this challenge is really worthwhile. These are books that have taken root in our social consciousness and reading them has given me a better understanding of our own culture. I can't wait to continue with my list! Buy The Thin Man on Amazon or find it at your local library. I've always avoided Hammett, because I thought he'd be too anti-women. But your review is making me rethink that. What did you think about the handling of women characters in the book? I hear about this author a lot. I have to read one of his mysteries. Great review. I always hear about these movies so I should probably check out the book ... and the challenge! Sounds pretty neat! Eva - Hammett doesn't treat his women very well but he doesn't treat his men very well either! I think it was worse in The Maltese Falcon. All of the women in that one were either mental or long-suffering for no apparent personal gain. In The Thin Man, Nora is treated pretty fairly and is bright and strong. There are the same flighty and unhinged women in this one too but there are also stupid and foolhardy men in it as well. Tea - I think it's worth reading at least one of Hammett's books if just for the Americana aspect. Jenners - If you're short on time, the movies, especially the first one, are awesome. I think I would probably pick up another Thin Man novel at some point just because Nick and Nora are funny.